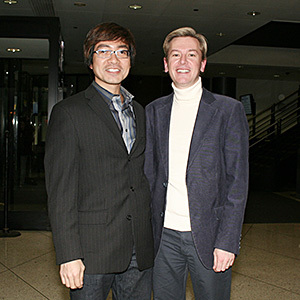 Professors Edward Lee and Graeme Dinwoodie co-founded Chicago-Kent’s new Center for Design, Law & Technology (c∆). Professors Graeme Dinwoodie and Edward Lee have teamed up to co-found an innovative new center at Chicago-Kent that focuses on design. The Center for Design, Law & Technology (cDELTA or c∆ for short) brings together the strengths of Chicago-Kent, its parent university, Illinois Institute of Technology, and the city of Chicago. Professors Dinwoodie and Lee are each, respectively, a co-author of the only two design law casebooks in the United States. Chicago-Kent has one of the top intellectual property programs in the country (ranked the No. 1 IP Program in the U.S. by Law Street Media in 2017), and the Illinois Institute of Technology’s Institute of Design is one of the top design schools in the world (ranked No. 22 in the world by Business Insider). And Chicago is home to leading design firms and companies in the United States. In conjunction with the Chicago-Kent Center for Empirical Studies of Intellectual Property (CESIP), c∆ will offer grants to fund research related to design, innovation and creativity. Dunstan Barnes, Ph.D., Associate, McAndrews Held & Malloy Ltd.
Christopher Carani, Partner, McAndrews Held & Malloy Ltd. This fall, the center will host a book talk on Design Rights: Functionality and Scope of Protection by Christopher Carani, a research affiliate of c∆ who is widely recognized as a leading authority in the practice of design law. In the spring, the center will host a public lecture on “Copyright Protection for Designs” by Professor Dinwoodie, a leading expert in comparative design law who has taught design law in both the United States and United Kingdom. Former U.S. Solicitor General Seth Waxman gave a talk titled "May You Live in Interesting Times: Patent Law in the Supreme Court" at the 2017 Supreme Court IP Review. The Supreme Court IP Review (SCIPR) is an annual conference that reviews IP cases from the U.S. Supreme Court’s previous Term and previews IP cases and cert. petitions on the docket for the upcoming Term. Chicago-Kent Professor Edward Lee submitted an amicus brief in support of Tam, arguing that the Lanham Act provision in question violated the First Amendment. 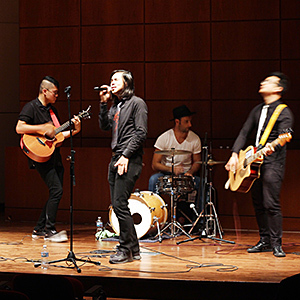 The Slants gave a special acoustic performance at Chicago-Kent following the 2017 Supreme Court IP Review. This year’s conference was sponsored by the law firms McDonnell Boehnen Hulbert & Berghoff LLP, Polsinelli, McAndrews, Held & Malloy Ltd, Morgan Lewis & Bockius LLP, Nelson Bumgardner PC, and Seyfarth Shaw LLP, and by Chicago-Kent’s Institute on the Supreme Court of the United States and the Center for Empirical Studies in Intellectual Property. Professor Graeme B. Dinwoodie will return full-time to Chicago-Kent as a Global Professor in Intellectual Property Law. 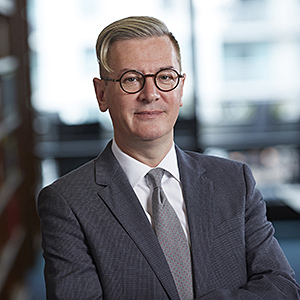 International IP scholar Graeme B. Dinwoodie, the professor of intellectual property law and information technology law at the University of Oxford, will move full-time to Chicago-Kent College of Law as a Global Professor in Intellectual Property Law. Professor Dinwoodie, who currently holds the IP Chair at Oxford, is a leading international authority in trademark law, design law and international intellectual property law. Professor Dinwoodie’s decision to re-join Chicago-Kent full-time reflects his enthusiasm for the law school’s Program in Intellectual Property Law, which he directed from 2001to 2009, helping to build the program’s international reputation before he departed to take up the IP Chair at Oxford. While at Oxford, he has also been Director of the Oxford Intellectual Property Research Centre and a Professorial Fellow at St. Peter’s College. 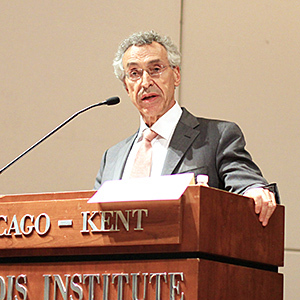 He noted that Chicago-Kent’s IP Program had reinvented itself to stay ahead of the curve. “The unique international and comparative dimension to the IP program has over the last decade been superbly augmented by new ongoing initiatives exploring the enhanced involvement of the US Supreme Court in the field, encouraging the use of empirical research to develop or critique current law, and cultivating a growing partnership with the practicing bar and PTO in the pro bono Patent Hub,” he said. In addition, Professor Dinwoodie is looking forward to being co-founder and co-director of the newly announced Chicago-Kent Center for Design, Law & Technology, and to participating again in the Chicago IP Colloquium, the LLM in International Intellectual Property Law, and the innovative Strategies in IP capstone course, all of which were founded during his time as director of the program. 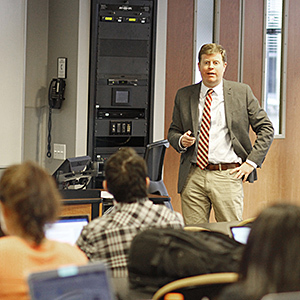 Professor Greg Reilly teaches Patent Law to a class that includes first-year and upper-level students. In fall 2017, qualified first-year Chicago-Kent students were for the first time able to enroll in upper-level elective courses in Patent Law or Copyright Law in their first semester of law school. The pilot program is an expansion of the school’s highly successful 1L Your Way program, which gives first-year students the option to take, in their second semester, an upper-level elective with second- and third-year students. The 1L Your Way program, popular among first-year students, better prepares them for their summer jobs by allowing them to study a course in an area of law they might specialize in. 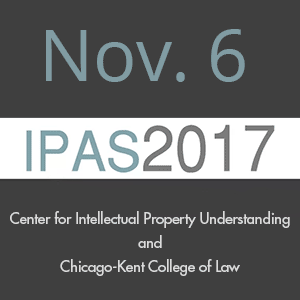 Chicago-Kent’s Center for Empirical Studies of Intellectual Property will host a conference on “The Power of PTAB: The New Authority in Patent Law” on October 20, 2017. The conference examines the rise of the Patent Trial and Appeal Board, which is on pace in 2017 to set a record of deciding more than 2,000 inter partes reviews (IPR) initiated by parties challenging the validity of existing patents. The conference convenes leading patent academics, attorneys from law firms, in-house counsel, and PTAB judges to examine various facets of the PTAB’s expanded powers under the America Invents Act. The day after the conference, Chicago-Kent will host a roundtable scholars’ discussion among leading patent law professors. 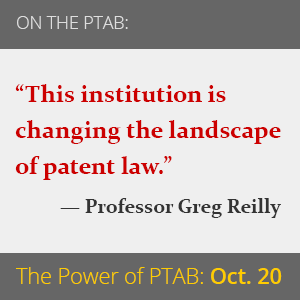 Professor Greg Reilly is spearheading conference planning with the help of an advisory board of practicing patent attorneys and members of the PTAB Bar Association. Professor Reilly’s recent scholarship focuses on important PTAB issues, including the constitutionality of PTAB review and cancellation of issued patents, as well as the justifications for claim amendments in PTAB post-issuance proceedings. The conference will celebrate the Chicago-Kent Journal of Intellectual Property’s new relationship with the national PTAB Bar Association as its official publication. For more information and to register, visit www.kentlaw.iit.edu/ptab2017. The Air-Supporting Batting Tee, invented by Bob Kauffman, supports a ball via an upward stream of air from a blower. The U.S. Patent and Trademark Office (USPTO) granted two patents in August 2017 that resulted from pro bono assistance of volunteer attorneys associated with the Chicago-Kent Patent Hub. The Chicago-Kent Patent Hub matches low-income inventors with the pro bono legal assistance of licensed, volunteer patent attorneys under a national program initiated by the USPTO pursuant to the America Invents Act. Erin Fox of Quarles & Brady, who chairs the Patent Hub Advisory Board, provided legal assistance to inventors Robert Kauffman and Phillip Owens with help from Chicago-Kent students Micah Hensley ’16 and Kwanwoo Lee ’17. 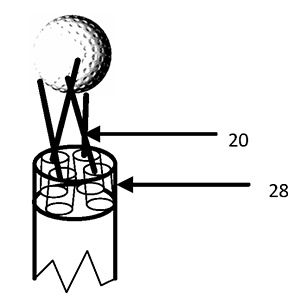 Bob Kauffman’s invention is an Air-Supporting Batting Tee that supports a ball via an upward stream of air from a blower. The blower uses four tubes to blow air at different angles, allowing the user to control the height of a floating ball by adjusting a pneumatic air source. Phillip Owens’ invention is a rubber case for smartphones and smart pads that allow for attachment of various interfaces (USB,VGA, DVI) and that allow such uses as mobile presentation from a smartphone, connecting to a mobile power station, watching movies from a TV monitor as a wireless device, connecting a second monitor while traveling, and transferring information from different devices. In two years, the Patent Hub has successfully placed 64 low-income inventors with patent attorneys willing to work pro bono. Thought leaders from business, academia and government will explore what various organizations need to know about patents, copyrights and trade secrets, consider what determines acceptable behaviors on the part of IP holders and users, and address the rapid rise in Internet IP theft and “efficient” patent infringement. Professor Mickie Piatt contributed to the planning of this innovative new conference. For more information, visit dpsdesignz.wixsite.com/ipas2017. Students engaged with IP thought leaders as Chicago IP Colloquium Fellows. For the past 16 years, Chicago-Kent College of Law and Loyola University Chicago School of Law have jointly sponsored and hosted the Chicago Intellectual Property Colloquium, which promotes discussion of a range of issues in intellectual property. 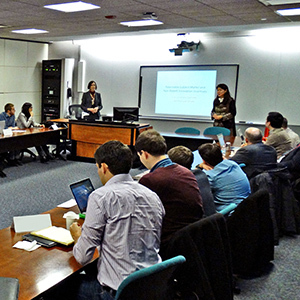 Each year, during the spring academic semester, six nationally renowned IP scholars are invited to Chicago to present and discuss their current research projects before selected Chicago-Kent and Loyola students—known as Chicago IP Colloquium Fellows.